A high rate of FPD has been reported in Japan. crammed together in one place. When FPD gets severe, birds have a hard time walking due to the pain, and suffer from stress and fever. In addition to birds being unable to walk, secondary infections can also occur. *Broiler chickens are susceptible to diseases since it’s been modified to grow in a short period of time over the years. On May 22nd 2017, we ordered 6 kg of domestic broiler chickens, Momiji (chicken legs) to observe FPD. As a result, we confirmed 105 legs that were infected by FPD out of 178 legs. * The conditions get worse towards the right. * We assessed “mild (score 1 & 2)” to “severe (score 3 & 4)” based on Welfare Quality Assessment protocol for poultry. * The severity could have been inaccurate since the legs were processed to have skin removed. * The images were taken on May 25th 2017. We confirmed that all of these legs came from one large meat company, referred as Company A, in Japan. First of all, let’s assess these legs based on Global GPA, which is used to certify agricultural items produced under safe management globally. Under Global GPA certification, it is mandatory to record diseases by checking the feet of birds. 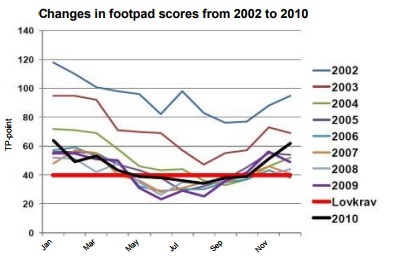 It is recommended to keep Footpad lesions under 30% as a welfare indicator. In case of Company A, it is 59%, as 105 out of 178 were confirmed to be infectious. So it is a level where improvement is needed according to Global GPA. In Japan, we have something similar called JGPA, which is a GAP certification for agriculture. However, the only requirement is to check the checklist in terms of animal welfare. In other words, you may obtain certification even if you have a bad score as long as you keep the checklist. So it is not a good indicator since there are no numbers set to evaluate animal welfare in this system. Next, let’s assess Company A according to Global Animal Partnership’s standards. Just like Global GPA, Global Animal Partnership’s also require monitoring of Foodpad Dematitis. There are 5 steps for FPD in Animal Partnerships, of which each step has the MAXMUM percentage of FPD rate. If it exceeds the MAX, a company will not be certified. Per this calculation, Company A is 68. This means, it would not even meet the standard set for Step1. As such, it’s safe to say that animal welfare for broiler chickens in Company A is poor, and needs to improve. In order to improve the situations to raise broiler chickens, we need to first know the FPD rate. It’s found to be effective to monitor and score FPD rate to reduce FPD occurrence. For instance, FPD rate has been rapidly going down since the scoring system was implemented in Denmark. * Scoring for FPD was implemented in 2002. * Red line indicated the legal requirement for FPD in Denmark. Farmers are subject to get fine if the scores for FPD exceeds legal requirements in Denmark and Sweden****. In many countries, there are companies that voluntarily check FPD rate in their slaughterhouses to provide feedback to farmers in order to improve the situation for broiler chicken. Standards for broiler chickens set by OIE also promotes setting scores for FPD so that welfare for broiler chicken can be assessed*****. In Japan, “ANIMAL WELFARE AND BROILER CHICKEN PRODUCTION SYSTEMS” promoted by Ministry of Agriculture, Forestry, and Fisheries states it is effective to check for the presence of contact dermatitis at slaughterhouses to assess animal welfare. Also, “Animal Welfare Study Group Textbook – Broiler chickens” created under “Animal Welfare Specialists Training Program” developed in 2014 and 2015 as part of their subsidy program at JRA shows Standards of FPD and its methods to check the standards. And yet, we are not aware of any examples of the practice-taking place in Japan. In a country where slaughtering chicken without stunning is not a problem at all, animal welfare issues for farm animals are way behind. We are not there yet in the implementation of a scoring system for FPD in Japan. Is it ok to sell diseased parts in the market? Many websites sell Momiji chicken legs at a low price. However, this is not dirt, but lesions. Is it ok to sell diseased parts as food in the market…? Article 25 in Poultry Slaughtering Business Control and Poultry Meat Inspection Act includes the presence of FPD, which is subject for inspection. Therefore, it cannot be sold in the market. In addition, Article 19 of the same act states it must be disposed. So we can say FPD must be disposed, and should not be circulated around in market by law. However, the reality is that more than half of the purchased chicken legs from Company A were infected. We contacted Ministry of Health and Welfare, who is responsible for chicken slaughterhouses. Their response was “it is up to individual slaughterhouses to judge and check the presence of FPD,” so by law, “it must be disposed” but it is unclear as to why these legs can be sold in market as food. We submitted an inquiry to Company A that produces these broiler chicken legs. Are there any measures in place to prevent FPD for broiler chicken such as setting perches and good methods to manage bedding? Is there any scoring system in place to assess the health of broiler chickens, such as how they walk and the rate of injury? Do you assess the quality of bedding, such as the number of feathers that are sand bathed or dirt on feathers? Do you evaluate FPD at your slaughterhouses to give feedback to producers? According to the Poultry Slaughtering Business Control and Poultry Meat Inspection Act, birds with skin infection are subject to be disposed. In your company, what is the standard to dispose your Momiji chicken legs? That said, chicken legs with severe infection are after all sold. So the deal they have, which thinks it is ok to sell such products, is already problematic.